Here they are … the Rights & Democracy list of endorsed candidates for the 2018 elections! A Rights & Democracy endorsement is a signal that a candidate is already a community leader on the issues that reflect RAD’s values and will champion those causes in the Legislature. A RAD endorsement comes with the expectation that elected candidates will work with RAD members on legislation of shared interest to their community. In that way, it’s more than just an election year activity—it’s the start (or continuation) of a working relationship. 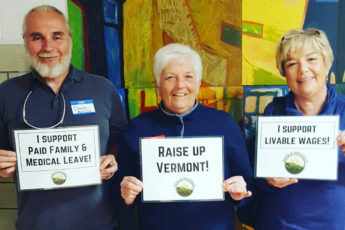 We urge RAD members, and non-members alike, to work this campaign season to elect candidates who will be willing to lead on the issues that matter to Vermonters—raising the minimum wage, passing paid family leave, ensuring we have clean water, pushing for a 100-percent just and renewable future, and ensuring that our state is equitable for all. With your help, and these champions, we can can build the legislative veto-proof majority necessary to make this happen. We have a lot of volunteer opportunities to help us win these elections, so sign up today and we’ll be in touch! * – indicates loss of contested primary on Tuesday, August 14th. In the statewide elections of 2016, RAD endorsed 37 candidates and 20 won their elections, including Attorney General T.J. Donovan, Lt. Gov. David Zuckerman, State Senators Debbie Ingram and Chris Pearson, and State Representatives Selene Colburn, Brian Cina, Kiah Morris, and Cindy Weed. RAD recommended an additional 12 candidates for election, and of those 7 won. To help support our work electing the kinds of candidates who will champion our issues, consider becoming a monthly sustaining member.